Last year Samsung revealed the Galaxy Tab S 8.4 alongside the Galaxy Tab S 10.5 and we rather liked both of them, so news of a follow-up slate is keeping us interested. China's Telecommunication Equipment Certification Center just approved two new devices and revealed some specs including the Galaxy Tab S2 8.0 weighing in at 260g with dimensions of 198 x 134 x 5.4mm. It doesn't take a rocket scientist to work out the 8.0 and 9.7 refer to the screen sizes of the slates, and the 8-inch edition is rumoured to have an AMOLED display with a resolution of 1536 x 1048, while the larger one is currently under wraps. If those dimensions for the Galaxy Tab S2 8.0 are correct that means it's set to become the worlds slimmest tablet. It will also run Android 5.0 Lollipop, have an octa-core processor clocked at 1.9GHz, LTE connectivity and 3GB of RAM. On top of that there's an 8MP rear camera, 2MP front facing shooter and expandable memory on top of the 16GB internally. Rumours for the larger slate are a little harder to come by but we're likely to have a similar setup with maybe a different processor and obviously a different design. 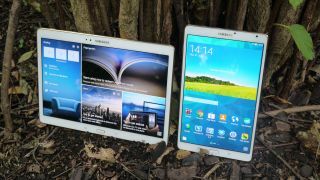 Read our review of the Galaxy Tab S 8.0 and 10.5 here.